>The Victory coffee shop on Atwood Avenue has the feel of a great coffee shop where I would be able to get some lunch and a coffee and hangout all afternoon doing homework and reading. But that was far from the case. About 10 minutes after getting to The Victory I wanted to leave which has nothing to do with its awesome decor, cool music, and awesome tin ceiling. The coffee was very strong and nothing too spectacular. The veggies in the vegetarian chili were overpowered by the intense use of cumin and cinnamon. It also had to be heated up in the microwave when I ordered it…that doesn’t say much about the soup’s freshness! But what really turned me off of this cafe was the lack technology access. First off, there is no WiFi…and if that was the only problem I would still understand the appeal of The Victory but that was just the first hit against people who want to stay connected while drinking over priced coffee. The big problem with this cafe was brought to my attention very abruptly and passive aggressively. I got a call while I was eating my lukewarm chili and 15 seconds into the conversation the owner shoved a “No Cellphones” sign in my face. I’m all-accepting of people who don’t want to use cell phones but I am not OK with people telling me I can’t use mine…especially when the cafe is filled with screaming children and loud alternative rock music already. I am also not ok with how the rule was presented to me. There are no signs posted (trust me…I looked for them pretty thoroughly as I was leaving) so unless you’ve had the sign rudely shoved in your first before, you probably don’t know cell phones are persona non grata. At least post the signs so people can try to follow the rule! It’s actually a pretty good business move because if the sign had been posted on the door I wouldn’t even have gone in. That’s probably not the same for everyone because I am a member of the addicted-to-cellphones generation but I still think you need to tell all of your customers and not just the ones you decide to ambush in the middle of a conversation. Bottom Line: If the food and coffee were better (and worth the price) I would ignore the disconnected feeling I get without cellphone use and WiFi but I will not be returning to The Victory. >I originally started this blog for a class assignment and fell in love with the format and the topic. But now that I am blogging for myself more than for a grade I have decided to focus less on saving money while trying to make really good food. I am still going to write about recipes I have tackled, tweaked and tasted, and about the general task of cooking. But I am adding a new blog topic; RESTAURANT REVIEWS! I have never been a reviewer but am very opinionated so this will be an interesting segue. I will try to review all restaurants, coffee shops, cafes, and even grocery stores that I visit. If you have a Madison-area food-serving business you would like me to review let me know! Turkey Meatloaf tastes better than it sounds! When I first found a recipe for Turkey Meatloaf I thought it would be a brick of Thanksgiving Day turkey mooshed together…not very appetizing! But then I decided to give the recipe a try because it had cooked vegetables and a lot of seasonings in it. 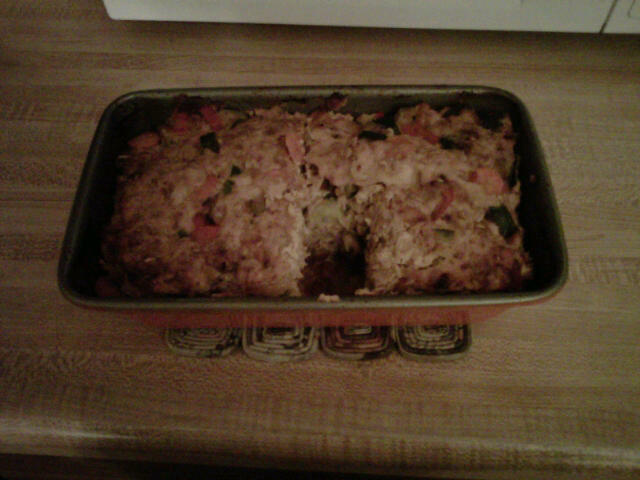 Turkey meatloaf with carrots, zucchini, yellow squash and onions. *Disclaimer* When using any type of ground poultry there are two options. Ground turkey/chicken or ground turkey/chicken breast. I recommend getting the ground turkey breast because the ingredients are water and turkey breast. If you look at the ingredients of ground turkey you will find both dark and white meat, skin and fat. So you can either have turkey (ground turkey breast) or turkey with other things ground into it (ground turkey). Your choice! The recipe is quite a bit different than traditional beef meatloaf because it had sauteed carrots, onions, zucchini and yellow squash in it. That’s one of the reason I decided to try the recipe! But once the vegetables are prepped the rest of the recipe is pretty much the same as a traditional meatloaf recipe! You mix in the vegetables and spices like garlic powder, salt, cumin, mustard, bbq sauce, hot sauce and Worcestershire sauce. One of the reasons I may have loved this recipe sooo much is because both the mustard and bbq sauce I had in my refrigerator were branded as Jack Daniels flavored so that added a nice kick to the mixture! The recipe also called for an egg to keep the mixture together after cooking but I forgot the egg and everything turned out fine. So if you want to take the calories count down even more not including the egg is definitely an option. After baking the inside of the meatloaf was moist and the outside was brown and crunchy! The flavor was a great combination of the vegetables and spiciness. And it wasn’t as greasy as beef meatloaf because ground turkey has a lot less fat than ground beef. I recommend turkey meatloaf for anyone who likes the heartiness of meatloaf but doesn’t like how greasy it tends to be. If you don’t like carrots or onions or zucchini you can substitute any of those for your favorite vegetables! Turkey meatloaf is the perfect combination of contrasting flavors; the heavy spices, and the light turkey and vegetables. And since the vegetables are already in the mixture I just ate it with some couscous or other cooked grains. Everyone’s turkey meatloaf could taste different based on the variations of ingredients they use. What vegetables would you use in your turkey meatloaf? What’s your favorite type of BBQ sauce and mustard (Jack Daniels?)? I’ve got the BEET (greens)! Now while I agree with spinach being on this list (cooked or raw it tastes like grass) everything else on this list I have cooked and been able to make pretty tasty! This week I am going to tackle the beets. When I went to buy the beets I noticed that I could buy just the red root part or a bunch of beets with the greens still on them. While struggling to shove all of the beet greens into a produce bag I started to regret my decision to get (and try to cook) the beet greens but they were actually the highlight of my beet experience. The first caveat to beets that I discovered wast that they are really hard to peel. I started off with a knife and then decided it would be best for my appendages if I used a vegetable peeler that took longer but has protective guards on all sharp blades. Beets are tough, round and once the skin is off, very slipper. The second caveat is that they turn your hands, counter, knife and cutting board is dark shade of pink (obviously I was using red beets). Don’t worry…by the time I was done with the dinner dishes the pink was gone on all surfaces including my hands so I would just suggest skipping the dishwasher that night and wash everything the old-fashioned way! After I chopped the beets into small cubes (they will cook faster if they are smaller) I coated them in olive oil and garlic powder. I looked up a bunch of recipes that call for a ton of butter and salt but what’s the point of eating something really healthy if you’re going to douse it with butter and salt? Other recipes also called for other spices but I would say a beet is like any other vegetable; once it is cooked, you can add any of your favorite spices to make it more tailored to your tastes. I am a garlic lover so decided garlic and olive oil was enough. I decided that straight on beets was not going to be the best way to tackle this dirty root so I combined it with chopped up carrots. There are multiple types of preparations for beets (steaming, boiling, sauteing…) but I chose roasting because I love when vegetables get crunchy on the outside! So I put the beets and carrots on a baking sheet (no need to grease the baking sheet because the beets and carrots have enough oil on them to keep them from sticking) and roasted them for 30 minutes at 400 degrees, taking them out a couples times to move them around and flip some of the bigger pieces. While those cooked in the oven I spent a great deal of time washing the beet greens because the Internet said they would be really gritty because beets are ground root vegetables. Mine seemed pretty clean but I don’t like eating dirt so I cleaned them really well and chopped up the leaves and red stems. Then I just sauteed them with olive oil, onions and garlic. It looks like a lot of greens in the beginning but they wilt up so fast that it turned out to be just enough for 3 meals. Roasted beets are alright (I kind of think they taste like dirty). 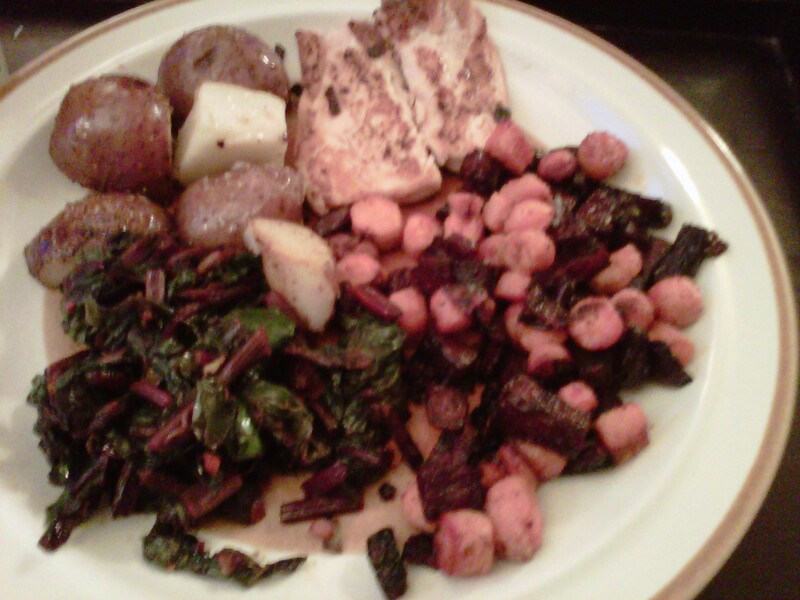 When I try making them again I am going to add some hot suace to the olive oil and garlic powder to give them a little more flavor but the beet greens were my favorite. 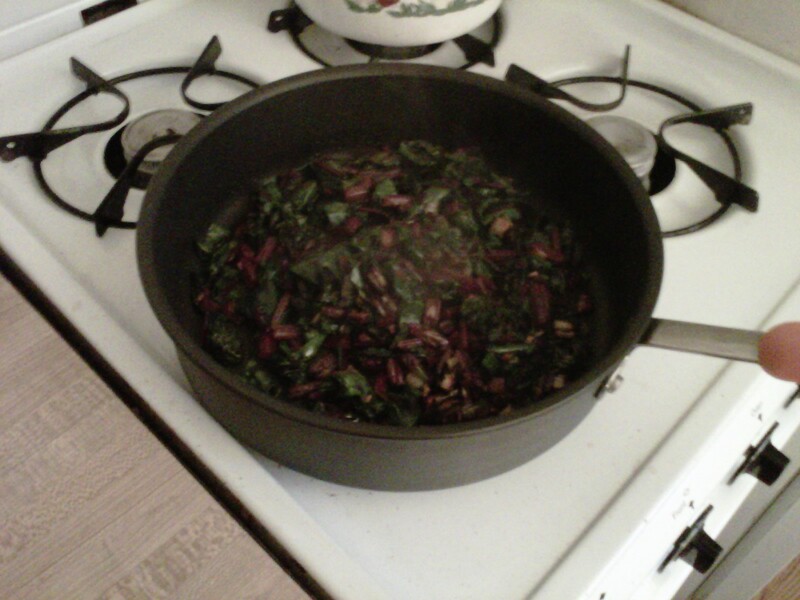 Sauteed garlic beet greens are SO GOOD! The olive oil and garlic wonderfully compliment the earthy, bitter flavor of the greens! I definitely like beet greens better than beets…too bad you can’t buy beet greens without beets! >So because I put the title of this blog in a caps with a lot of exclamation points behind it I am assuming you thought this would be an excited blog post about the wonders of football and massively expensive commercials. Sorry, but that’s not what this is about. I understand why the Super Bowl is a big deal for some people but what I don’t get is the food people eat during the Super Bowl. I may be exposed to more of this because the Packers are in the Super Bowl this year but when I was grocery shopping yesterday I saw green muffins…they were literally green. And after looking at the label it realized they weren’t moldy but in fact dyed that way for Packer fans…am I the only one that finds green muffins odd? Aside from dying food the color of the teams playing everything else is consumed during Super Bowl Sunday is just mega unhealthy. Why not eat green peppers, cucumbers and guacamole? They’re green! I understand the desire to eat fried foods, hamburgers, chicken wings and a lot of cheese but throwing in alcohol? There’s nothing worse than a massive fried food baby and a hangover. And what is the fascination with eating food shaped like a football or a football helmet? Does it make cookies or cheese taste better? What about the large beer and chip displays at the grocery store? The beer spells out “Go Pack” and the chips look like a football field…equipped with goal posts and yard lines. That’s a lot of work for a football game! To each his own though I guess! I will be celebrating the Super Bowl with a frozen cheese pizza that I will add mushrooms and green peppers to while reading a book on Global Media Ethics. What about you?